1. VACUUM INSULATED THERMAL PITCHER | LAB TESTED THERMAL RETENTION FOR HOT COFFEE AND COLD DRINK – Enjoy the unadulterated flavor of your freshly roasted coffee or fruit juices served at its most optimal temperatures even after hours of storage – thanks to the coffee carafe’s reinforced vacuum insulation technology that stands out from the rest of insulated carafe in the market when it comes to thermal insulation. 2. EXTRA SAFE WITH TIGHT LOCK LID AND NON-SLIP RUBBER BASE | GERMAN ENGINEERED LID SECURE MACHANISM that always locks AT THE RIGHT SPOT unlike other carafes. | Made with double walled surgical grade stainless steel body for uncompromised interior vacuum insulation while remaining cool and safe to touch on the outside. Features easy grip handle and Non Slip Rubber Base for perfect balance and stability. 3. PRESS BUTTON TECHNOLOGY | SPILL-FREE SPOUT | HEAVY DUTY & CRAFTED FOR YEARS OF USE – Our carafe features generous capacity, ultimate comfort in handling through the press of a button, and premium spout with NO leaking , dripping or spilling for single-handed pouring. EXTRA WIDE top opening makes it easier to clean, fill and pour than other carafes. Double wall solid structure gives you peace of mind. 4. SLEEK ELEGANT DESIGN | PERFECT GIFT BOX | FREE BRUSH INCLUDED – The elegant stainless steel design with satin finish gives your kitchen a touch of class. Supreme gift box package makes it a perfect gift for your friends and family. FREE BRUSH ensures easy and thorough cleaning. 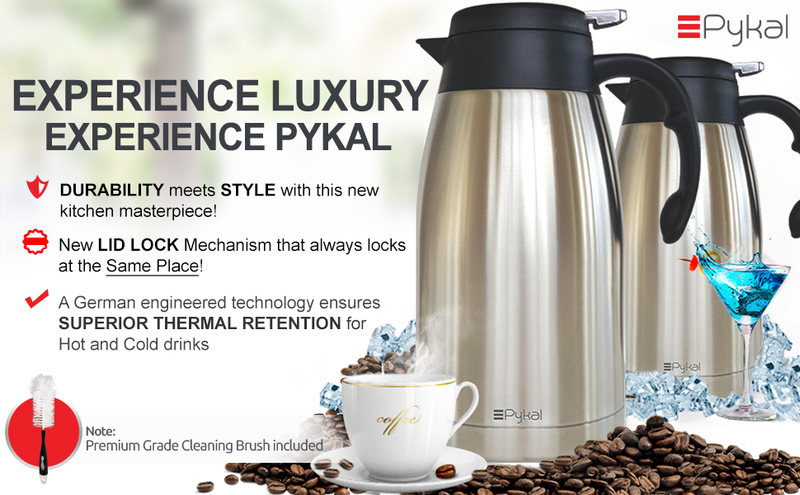 ✅ Pykal’s Thermal Coffee carafe PYX018X has a 2 Liters(68 Oz) capacity and is great for serving hot or cold beverages. ✅ German engineered advanced vacuum technology ensures phenomenal thermal retention properties that is so above the rest. Outside body is cool & easy to touch/hold. ✅ Double-wall stainless steel construction with Surgical Grade Stainless Steel on the inside. ✅ PREMIUM-GRADE Cleaning brush and a PERFECT GIFT BOX is included with your purchase. 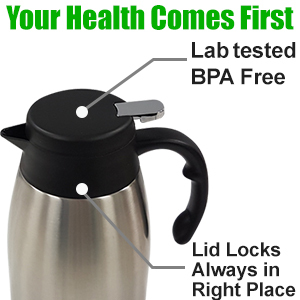 ✅ Ideal use – as a tea/coffee thermos, milk carafe, creamer carafe, juice, wine, water pitcher. ❌ DO NOT put the Carafe in the dishwasher or submerge it in the sink as this will allow water to penetrate through the inner and outer cylinders and damage the insulation. ❌The top of your carafe has been mechanically sealed to provide for better insulation results and as such is not detachable. ✅ New FEATURE: When closing, the lid always locks in the correct place. ❌ The top assembly is not BPA FREE meaning harmful chemicals make contact with your beverage. ✅ Cold beverages stay cold for well over 24 hours. It is even More Effective for cold drinks. 1. PREHEAT the Carafe by pouring a few cups of boiling hot water in the carafe and leaving it there for 10 mins. 2. POUR beverage as hot as you possibly can. The hotter the beverage, the longer it is going to stay hot. 3. Start out with carafe being 90-95% FULL. As the beverage levels drops in the carafe, the heat dissipates to the upper levels of the carafe and somewhat absorbed by the stainless steel wall; This is due to PHYSICS. Hence at only 15-20% full coffee will not stay steaming hot for much longer unless the carafe is topped up. This is common with Thermal Carafes. To pour, simply press the push button and tilt. To stop pouring, release the push button and sllowly tilt the carafe back to its original position. Ideal use as tea/coffee thermos, milk carafe, creamer carafe, juice dispenser, wine dispenser, water pitcher. NOT ADVISED for use with Carbonated Drinks. Wash and rinse the Carafe thoroughly before you use it for the first time. DO NOT put the Carafe in the dishwasher or submerge it in the sink as this will allow water to penetrate through the inner and outer cylinders and damage the insulation. DO NOT leave tea or coffee inside the Carafe for more than a full day. When storing the Carafe it is best to remove the lead for a few hours to allow it to dry thoroughly. DO NOT use metal or abrasive scrubbers when cleaning the Carafe inside or out as they may damage the Stainless Steel. Wash with warm soapy water after each use and use the soft bristle brush provided for cleaning the inside. Tighten the lid by rotating it counter clockwise. Ensure you dry the top before you rotate it. Do not rotate it all the way or it may be hard to open again. If carafe is dropped or subjected to strong shock/impact, dents/depressions can form, reducing its insulation properties. Keep the carafe 85-90% full. Overfilling the product may stiffen the push lever or cause the contents to spill when closing the cap, resulting in burns. The contents may spill and result in burns or staining of the car’s interior. Doing so may result in damage to the product or accidents. I am very impressed on this Thermal Carafe..I have used hot and cold beverages that lasted a whole day without losing temperature or flavor..Honestly, it is the BEST one that I have ever used.. Great quality, attractive, and had features other carafes do not have…It works well..[ just would like the push down lever to be made of metal or a stronger material..anyway no problem] You can not go wrong in purchasing this product…Thank you Pykal for another great product. I brought this for my Mom who just needed something small to keep her coffee hot. I checked her breakfast coffee last night, and 12 hours later, it’s still warm. It’s the perfect size for her and she loves it! 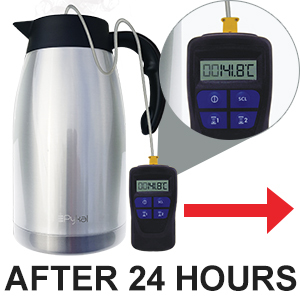 I plan to buy one for me.Thanks You Pykal for this Coffee Thermal Carafe. Really one of the best thermal carafes for the value to keep your hot drink last longer. I tried it yesterday. I kept my tea in the morning and it remained hot for the whole day. Love this product. Thank you Pykal! It looks stylish with satin finish. It works perfectly fine for me. Exactly the one thermal carafe I was looking for!! I love this product. The perfect lid with the press button features for easy pouring and its vacuum insulation keeps the drink hot. Always a pleasure with Pykal. Thank you. This coffee carafe is looking promising. I had one from another brand before and it didn’t keep the coffee hot. I bought this one and so far it is really doing well. I am a coffee person and I like to make it by myself. This coffee carafe is actually large and really keeps my coffee hot for longer. Would like to recommend to all. Its’ worth it! Just wonderful. Suits for both hot and cold drinks. My companion for hot coffee. Best thermal carafe I ever had. Got one yesterday. It is of nice quality and works just great. Perfect size. Water stays hot for hours. Handy thermo. Came in a perfect gift box with a cleaning brush. That’s wonderful. By far the best thermal carafe I have used for the given price. Water stay hot for the whole day. Good thermo carafe. Éasy single handed pouring with safe tight lid. 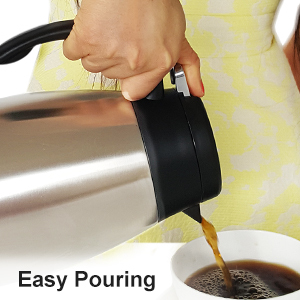 The push button locking mechanism makes easy pouring and handling. Love this stainless thermal carafe and rubber base keeps slip at bay. After going through all those positive reviews. I finally got one for myself. I must say it is the best of its kind. Would recommend to everyone. I had one thermo which is just rubbish now. The inner glass liner was broken and couldn’t be use anymore. And I heard about this double layer stainless steel thermos which I come to know that is better than the glass liner for heat retaining capacity. It does well to keep drink hot. I am completely satisfied with it. Thank you! This stainless steel thermal carafe is beautifully designed and very sturdy. It keeps coffee hot for a long time I would say until I am on work(8-10 hours). Extremely solid carafe comes with a cleaning brush which is a necessary bonus makes cleaning easy. Their customer handling is special won’t get any better. One important thing is its rubber ring at the bottom which makes it comfortable over any plain or bench top. Double-wall Carafe with vacuum insulated keeps tea hot for a long time. Good option for a busy schedule; just put tea once and drink it all day. For best results put some hot water to let the inner wall get warm then pour tea it stays hot for long. Lid lock is very tight that always locks at the right spot. Moreover, it features easy grip handle and non-slip rubber base is perfect for balance and stability. Furthermore, Its press button technology provided ultimate comfort in handling, and premium spout with no leaking, dripping or spilling for single-handed serving. It has a wide top opening makes it easier to clean. Overall, Nice carafe looks good in our kitchen. Highly recommended. Special stainless steel carafe perfectly designed for our needs. We usually drink lots of coffee throughout the day and it keeps hot for quite a long period. This carafe is also good for keeping juice cold for hours. An amazing asset for our family once filled with hot coffee can be used for the whole day. On top of that pykal’s customer service is highly impressive they sent a follow-up email asking any concerns regarding the product. Not everyone can do that. Much appreciated!!! Looking to buy other products by PYKAL. Arrived in a perfect gift box. 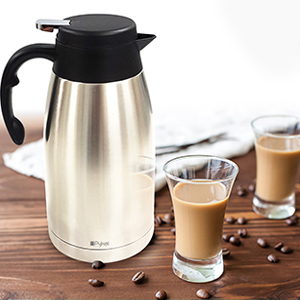 High-grade quality Carafe using it for a wide range of purposes as milk carafe, creamer carafe, water pitcher, tea and coffee carafe. Best thing is its lid always locks at the right place while rotating cap. Besides, It is easily portable and is good for long travels effective in keeping tea and coffee hot for long hours. PYKAL’s customer service is very responsive. Happy with purchase. Only thing is their follow-up emails, which are irritating.